So your formal event is just around the corner and you’re looking for a tuxedo or suit rental to wear. Wanting to find an ensemble that’s very much in style, you find the term “slim fit” regularly shows up in your online research. Your first thought might be that “Slim Fit,” means a tight-fitting, uncomfortable ensemble that might lead to an unpleasant rental experience and a generally unpleasant day. This is totally untrue! Rather, think of a slim fit tux or suit this way: While it’s true less fabric is used in the tailoring of a slim fit ensemble, the cuts are generous enough to provide a very comfortable fit. And since a slim fit is going to fit closer to your natural body shape, the result is a flattering look that accentuates your form and looks similar to an expensive, tailored-to-fit ensemble. EVERY GUY CAN BENEFIT FROM THE CONTEMPORARY SLIM FIT LOOK; IT WILL ENHANCE AND FLATTER THEIR PHYSIQUE. Another concern guys sometimes have is assuming a slim fit style will not work for their body type if they are not skinny. This is also untrue. Slim fit styles may be worn by lots of body types. Every guy can benefit from the contemporary slim fit look; it will enhance and flatter their physique. And, that’s a good thing! What are Slim Fit Tuxedos and Suits Like? Remember, slim fit tuxedos and suits are simply tailored using less fabric. This means both the jacket and pants are going to fit closer to your body without constricting your movement. The Ultra Slim Cobalt Blue Tribeca by Ike Behar is hugely popular for weddings. The shoulders of any slim fit jacket will sit nicely at the edge of your shoulder rather than drooping over the edge, which is a sure sign of a poorly-fitted jacket. The torso of the jacket will taper from the shoulders to the waist giving you that classic ‘v-shaped’ look. The length of the jacket will be slightly shorter than other fits. The lapels of any slim fit tuxedo or suit will be slightly narrower to complement the narrower cut of the jacket. Coordinating slim fit trousers will have a flat front, not a pleated front. Slim fit trouser legs will taper gently towards your ankles. Slim fit trousers typically have a minimal break at the bottom, if any, and can be ordered as such to suit your taste. Wait, what about Ultra Slim Fit? You’ll notice Ultra Slim Fit Tuxedos and Suits are found on our website as well. Ultra Slim tuxedos and suits are, you guessed it, slimmer companion styles to slim fits. Confused? Don’t be. JFW offers four styles that are available in BOTH slim fit and ultra slim fit cuts. These include the Michael Kors Berkeley Tuxedo and the Michael Kors Sterling Suits in black, navy and steel grey. These styles can guarantee your entire wedding party will coordinate and look great in either slim fit or ultra slim fit. If you know your entire wedding party would enjoy the ultra slim fit look, there are three styles on our site from designer Ike Behar. The Grey Plaid Hamilton is a very attractive and sophisticated style especially when worn with its matching fullback vest. If you have your heart set on blue – which is a very popular color in men’s tuxedos and suits right now – see the Cobalt Blue Tribeca. And, if you want to flirt with a James Bond vibe, the White Waverly will turn heads. These styles are ultra slim fit only and do not have a slim fit companion style. THE SLIM FIT LOOK IS UNQUESTIONABLY ON TREND RIGHT NOW AND SHOWING NO SIGNS OF GOING AWAY ANY TIME SOON. IT’S THE LOOK YOU WANT IF BEING FASHIONABLE AND STYLISH AT YOUR FORMAL EVENT IS A PRIORITY. 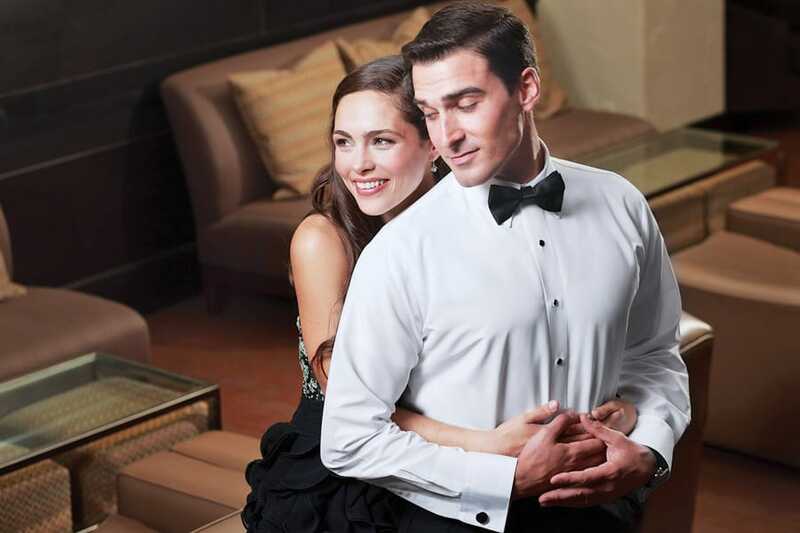 Since you are wearing a slim or ultra slim fit tuxedo or suit in the first place, you should choose a fitted shirt. The best choice is the Fitted Microfiber Shirt. Not only will it fit well and be comfortable, its trimmer cut will match the silhouette of your slim fit jacket. Your slim fit trousers will taper towards your ankles and your shoes will not be covered up by a big break in fabric. Therefore, go ahead and show off your shoe style! The Dunbar is a great shoe if you are wearing a tuxedo or suit. Create a contemporary 3-piece look with a matching vest worn with a tuxedo or suit. A colorful fullback vest is a way to bring more color to your ensemble. There are no rules here, choose any color that works for you. Patterned ties and pocket squares are a given. Speaking of ties, bow ties are the most popular tie choice right now and JFW has a wide variety to choose from. Finish off your ensemble with a pair of colorful socks and matching suspenders. You can rely on your Jim’s Formal Wear Retailer to properly measure and size you and your guys for Slim and Ultra Slim Fit ensembles. The slim fit look is unquestionably on trend right now and showing no signs of going away any time soon. It’s the look you want if being fashionable and stylish at your formal event is a priority for you and your party!